The Environment Agency should be given tougher powers to oppose house building on flood risk areas, MPs have said. The environment, food and rural affairs select committee criticised authorities for allowing homes to be built in flood risk areas against expert advice. It said the Environment Agency needed statutory powers to oppose building where it felt there was significant flood risk. More than 5m people and 2m homes and businesses were at risk of flooding. Also at risk were assets worth £250bn, the agency said. Members of the committee say they were concerned that in 2004 nearly 700 houses were built in flood risk areas against agency advice. They also said with the effects of climate change, the risk of flooding could only increase. 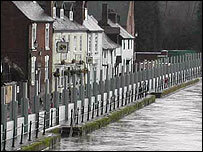 The committee recommended that the agency's funding for flood defence work should eventually increase to £1bn a year. It also expressed concerned about a severe shortage of specialist staff, caused in part by the decline of university courses offering relevant scientific subjects.